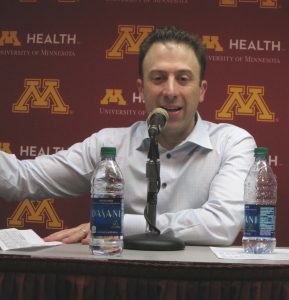 Minnesota head coach Richard Pitino called it a “perfect game.” Three former Golden Gophers coaches told Sports Headliners Minnesota’s 86-76 win over the Louisville Cardinals this afternoon was the team’s best performance of 2019. A friend in Des Moines for the NCAA Tournament game described it as beautiful to watch. However you want to say it, the Gophers gave a success-starved program and fan base a very happy Thursday afternoon by winning their opening game in the East Region that features national powers Duke and Michigan State, No. 1 and 2 seeds. Pitino made the “perfect” reference on his postgame radio show heard in Minneapolis-St. Paul on KFXN Radio. He was elated to win his first ever NCAA Tournament game in the closing weeks of his sixth season at Minnesota. The tourney win was just the program’s second in six tries since 2000. Pitino’s team has experienced highs and lows this season. The Gophers had a stretch where they lost six of seven games in February, before rallying to win five of their last seven including today in a dominant performance against Louisville. At times things have been difficult off the court, too, including the death of guard Dupree McBrayer’s mom. Minnesota has been resilient, though. “It’s been a really fun group to coach,” Pitino said after the game. The Gophers have embraced the underdog role in recent weeks and again today as they upset No. 7 East Region seed Louisville. As the No. 10 seed, Minnesota wasn’t expected to win against a Cardinals bunch—that while stumbling of late—held a win over powerful North Carolina and almost took down Duke, the nation’s No. 1 ranked team. Nuness was also impressed with the coaching of Pitino and his staff. The Gophers, he said, changed up defenses including using a full court press. Louisville specializes in three pointers but Minnesota held the Cardinals to nine made threes and 34.6 percent on conversions. 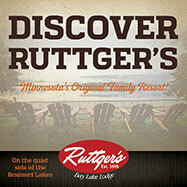 “They played a heck of a game,” said Jim Dutcher, who coached the Gophers to the 1982 Big Ten championship. He called the win the biggest of Pitino’s six years at Minnesota. The Gophers, who built their second half lead to 19, had 11 three pointers in the game, including two from power forward Jordan Murphy who entered the game with just six in the previous 34 games. When the Gophers came out of halftime leading 38-33, Murphy hit a three pointer to start the Minnesota run. “When you get him shooting three pointers, you got something going,” said Fitch, who praised how Minnesota responded to Louisville’s late game press and poise throughout the afternoon. The Gophers’ record is now 22-13, while Louisville is 20-14. Next up for Minnesota is a rematch against Big Ten champion Michigan State, a team that defeated the Gophers 79-55 in February in East Lansing. “From here on out, it gets tougher (advancing in the tournament),” Fitch said. Dutcher thinks Minnesota has a “good chance” of winning, though, noting the Spartans are known for scoring droughts. If the Gophers can guard like they did today, covering both the perimeter and interior like seldom before, it could make things interesting. Unlike this afternoon when the teams didn’t know each other that well, there will be all kinds of storylines the coaches will be anticipating. Dutcher said MSU power player Nick Ward has bullied the Gophers inside in the past, although he has been playing with a hand brace. 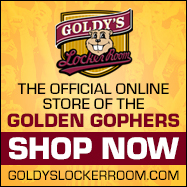 Minnesota’s Daniel Oturu and Murphy (slowed by back spasms today) will have to respond. Gabe Kalscheur led the Gophers in scoring against the Cardinals with 24 points and made five of 11 three pointers, the best of anyone in the game. Kalscheur had some open looks that indicated the Cardinals weren’t all that familiar with his long distance ability. Pitino compared today’s game to a “war.” Against the physical Spartans, the war figures to escalate on Saturday. Gophers basketball reserves Hunt Conroy, Michael Hurt and Brady Rudrud were among the 928 Big Ten student-athletes competing in winter sports who were announced yesterday as Academic All-Conference. To be honored student-athletes must be enrolled fulltime at their institution for a minimum of 12 months and carry a cumulative grade-point average of 3.0 or higher. Saturday night’s WCHA men’s playoffs title game at the Verizon Center in Mankato was a near sellout as of late yesterday afternoon. The championship game has sold out the last two years at other sites and this year matches regular season champ Minnesota State against Bowling Green. Three of the top four teams in the latest USCHO national rankings are Minnesota programs, with St. Cloud State No. 1; Minnesota State, No. 2; and Minnesota Duluth No. 3. Massachusetts is No. 4. The Gophers aren’t ranked but Bob Motzko, who just finished his first season as head coach, has the reputation of being an outstanding recruiter and is likely to make Minnesota a power again. The Twin Cities-based WCHA remains a favorite to add Arizona State as a member in a couple of years. Because ASU is playing and scheduling as an independent, the Sun Devils haven’t played a game since March 2 and won’t be back on the ice until March 29 when they participate as an at-large team in the NCAA Tournament.